Hello blog followers! 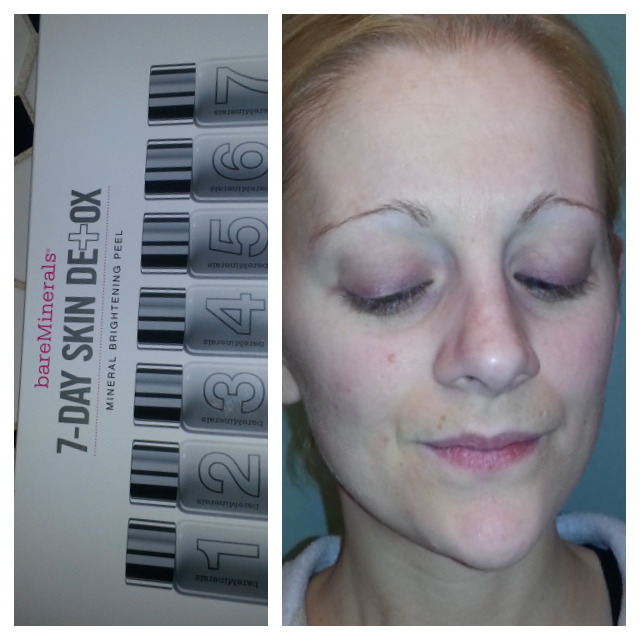 Since my blog is all things thrifty and trendy, and since I have been meaning to try this for a while, I thought I would try the new Bare Minerals 7 Day Detox. I plan to document it. I have very sensitive skin, and Bare is the only makeup and skin care I use. I do use the L'Occitane divine cream occasionally, but everything else from face wash to foundation is Bare. Ok, so I'm on day 2 of the Detox, and I put step one on last night. (Its one vial a day on clean skin for 7 days straight.) Its supposed to give the same results as a $200 facial, but for $75 and you can do it yourself. I actually work at Bare part time, mainly for the discount, so I'm hoping this ends up being a good pick. After I put on step one, my face felt very tingly and a bit like burning. It scared me at first, because obviously I worried it would make my face red or raw or something else aesthetically unappealing. But, the feeling only lasted a couple minutes, and once it dried, I was able to put hydrating moisturizer on my face, which felt like a relief. So... so far so good! Today my skin felt fine, but I didn't yet see a visible difference. More to come on this, I'll be posting ootd's each day this week and I'll also post the results (and journal entries) from my detox. Note my awful "before" makeupless face. Eeek!